The Titus Technological Laboratories 3DRX is a digital audio repeater and crosspoint switcher. 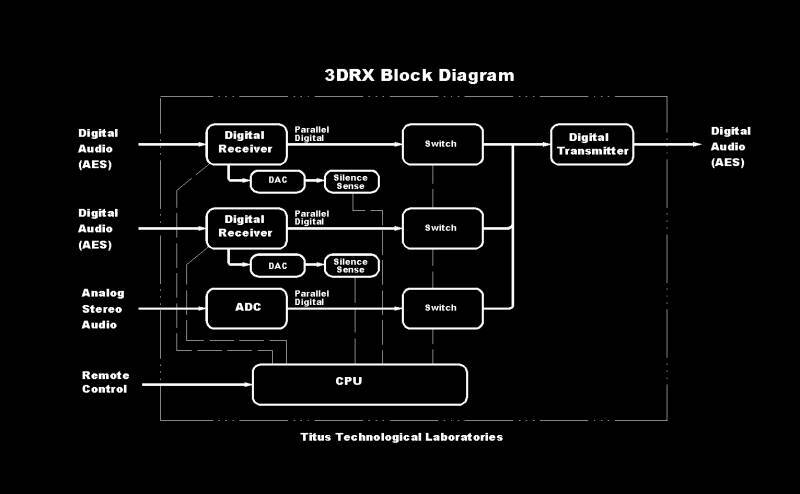 The 3DRX has three inputs and one output. The first two inputs are digital audio inputs. They can be either AES-3 balanced, XLR type inputs or AES-3ID BNC type inputs. They can also be either terminating or bridging inputs allowing sampling of an existing serial digital audio data channel. The third input to the 3DRX is a stereo analog audio input. The serial digital output conforms to both AES-3 and AES-3ID standards. The 3DRX can automatically switch to the secondary digital input if the primary digital source fails (loss of lock, data error, etc.) OR LOSS OF AUDIO ON THE DIGITAL SIGNAL!. A tertiary stereo analog source can automatically be switched to if the two stereo digital streams fail. The user can select which sources are switched on-line and under what conditions as well as select the time delay before actions. The stereo analog inputs are digitized in the AES/EBU format at 24 bits and either 32 kHz, 44.1 kHz or 48 kHz sample rate (user selectable) OR an external digital audio synchronization source! Besides operating automatically the 3DRX can also be controlled by remote control allowing the user to select the active source remotely or from the front panel push button controls in either a manual or an automatic mode. The 3DRX can also be controlled and programmed by an RS232 link or by a Bluetooth serial terminal connection, for instance a Bluetooth terminal application on a cell phone. This allows the engineer to simply stand near the 3-DRX with his cell phone to control, program, or monitor the 3-DRX. The 3DRX is designed to also be used as a digital serial audio repeater when used in a "transparent" operating mode (AES in to AES out). The digital signal in this mode is not decoded into analog but remains in the digital domain. When the 3DRX is operating in this mode and inserted into any digital serial audio cable run the length of the cable can be effectively lengthened. This is an active repeater and not simply a direct "hardwire switch" path and as such can be used to effectively extend cable lengths. The 3DRX operates up to 24 bit, 96 kHz stereo digital audio for all digital inputs and outputs. In case of a power failure an internal direct relay bypass is provided to connect the digital AES input number 1 to the AES output bypassing the unit. Data rate Source 1 and 2: 32 kHz to 96 kHz - automatic sensing and switching data rate on the inputs. Output will follow input sampling rate. 20 to 24 bit word length. Source 3: User programmable sample rate (32 kHz, 44.1 kHz or 48 kHz or external digital audio synchronization source, 24 bit word length. Terminations: Serial digital inputs and outputs, XLR and BNC conforming to AES/EBU specifications for 150 Ohm twisted pair and 75 Ohm coax. Switchable input termination (75 Ohm, 110 Ohm, bridging). Source 3 analog input on XLR terminations (balanced - bridging inputs). External SYNC input 110 Ohm or bridging. Power: 90 to 240 VAC, 50 to 63 Hz, <35 watts. Output connectors remote: DB-9 for RS-232 and remote direct control.